Whatever front implement you intend to use, HE-VA have the ideal front linkage for the job with lift capacities from 1.5 to 5.5 tons. What’s more, with the different models which are in our list, HE-VA has a front linkage to suit every tractor with over 800 different models available. All HE-VA linkages incorporate the Vertical Fold System (VFS) allowing the link arms to fold fully back when not in use improving maneuverability and safety. Fitting is simple and quick, as the whole side plate can be removed. 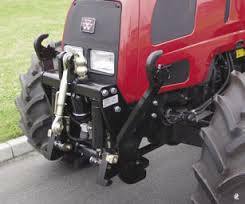 Also on most models, the linkage bolts onto the front of the tractor as well as the side giving more secure fixing to the tractor. Case IH, Fendt, Fiat, Kubota, Lamborghini, Landini, Massey Ferguson, McCormick, Renault, Same, Steyr, TYM, Valtra and Zetor. 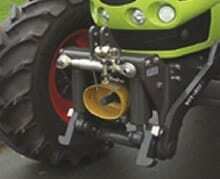 With a product range of about 800 different models, there will always be a suitable linkage for your tractor. 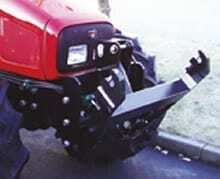 Designed for small to medium sized tractors from 20 kw (28 hp) up to 60 kw (83 hp). The 1.5 ton linkages are integrated into the design of the tractor providing all the benefits of their large counterparts. The 2.5 ton linkages are designed closely around the tractor subframe to provide strength, simple fitting and ensuring they become an integral part of the tractor. 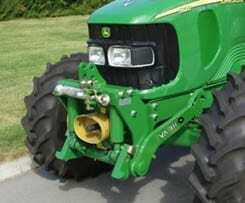 Recommended for tractor sizes from 50 kw (69 hp) and up to 95 kw (131hp). The 3.6 ton linkage is the most popular in the HE-VA range; individual linkages fit closely around the tractor sub-frame providing strength without restricting other tractor functions. Recommended for tractor sizes from 70 kw (97 hp) and up to 150 kw (207 hp). The 5.5 ton linkage is the largest in the HE-VA range providing the strength required for the work rates associated with larger horsepower tractors whilst the design avoids limiting other tractor functions. Recommended for tractor sizes from 110 kw (152 hp) upwards. 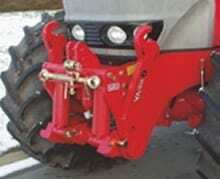 Front PTO power is available for most tractor models and linkage sizes. The PTO units have a completely self-contained oil supply and use a ‘soft start’ electro-hydraulic clutch to smoothly engage the power. A replaceable oil filter is incorporated into the gearbox for servicing. 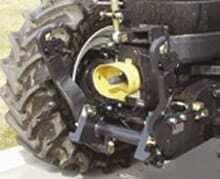 The 2.1 ton standard linkage is a simple but strong unit, designed for 30 kw (41 hp) to 90 kw (124 hp) tractors. 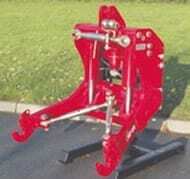 Adapted side brackets for almost all tractor models can be supplied as an optional extra. The 4 or 5.5 ton Multi-fit linkage incorporates all the standard features of 2.5 to 5.5 ton linkages but is manufactured without full length side plates. This multi-purpose linkage has short side plates with multiple attachment holes so that it can be adapted to fit various machines and tractors where a three point linkage is required, e.g. trailers, slurry tankers & 4 wheel drive vehicles. HE-VA was founded in 1977 by Elly & Villy Christiansen starting the production on the farm at Bjergby near Nykøbing Mors, Denmark. As they both were born and raised in the country, there was never any doubt that the new engineering works should be devoted to agricultural machines. As early as 1980 more space was required, and the factory moved to bigger localities in Nykøbing Mors where many extensions have been performed through the years. In 2001 a new factory and administration building of 7,500 m² in total was brought into use at the address N.A. Christensensvej 34, where the company’s administration is still accommodated. With the takeover of Doublet Record in Ørding on the island of Mors in 2002, the company’s production area and number of employees were suddenly doubled in size, and agricultural machines were now produced at two addresses. With the latest extension in the summer of 2006, today the total production area amounts to a 26,400 m² ultra-modern production facility setup with 125 employees. With all production gathered on the Island of Mors, HE-VA has the possibility to customize machines individually for each customer, and you can be sure that goods will arrive at the time promised.